Stay Cool & Refreshed This Summer with @BarefootWine Refresh Spritzers! Drinking wine is a ritual that many people enjoy – involving the bottle, corkscrew, glass, food pairings and more. But what about those rooftop parties, cookouts, and lazy days by the pool where everyone is in search of drinks that are quick, easy and refreshing? I think, especially during the summer, adults are looking for easy to drink, easy to throw in the beach bag, cooler, or cup holder, drinks that you don't need a bunch of accessories for! Wine is usually not that beverage...until NOW! Great news! 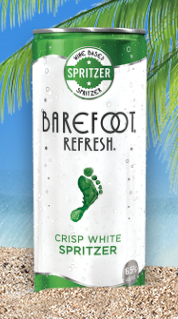 Barefoot Wine & Bubbly has you covered with the national release of Barefoot Refresh Spritzers…in a can! These flavorful, light and lively spritzers are now in single-serving cans that can go where glass and bottles aren’t always welcome. With two refreshing flavors, Crisp White and Summer Red, Barefoot Refresh Spritzers are best enjoyed when chilled – straight from the can, poured over ice or mixed in a delicious summer cocktail. Featuring aromas of peach, lemon-lime, and crisp apple. Chenin Blanc and Riesling make a perfect pair in this standout sipper. Featuring aromas of raspberries, oranges and ripe berries. Moscato, Zinfandel and Pinot Noir join forces to make one deliciously fruity spritzer. You can purchase these Barefoot Refresh Spritzers in stores nationwide as 4-packs for $8.99 or individually for $2.49.